Get your Valentine’s Day Candy Early! While the holiday season is now over, we still have other holidays on our radar. Next up is Valentine’s Day! Don’t forget your child’s class, your coworkers, or your loved ones with these fun Valentine’s Day Candy packages. Give something different for your child’s classroom party with these candy bracelets or lollipop valentines. Or, go classic for work or home with these conversation heart boxes. Your valentine will love these sweet treats, and you will enjoy the day even more as you didn’t have to rush to buy candy! 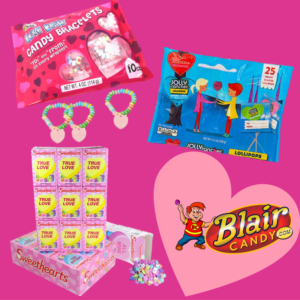 Shop all Valentine’s Day Candy now at BlairCandy.com today.